Given the commitment to get here, most people bring provisions for at least four days. Today is July 3rd and we are packing for seven. 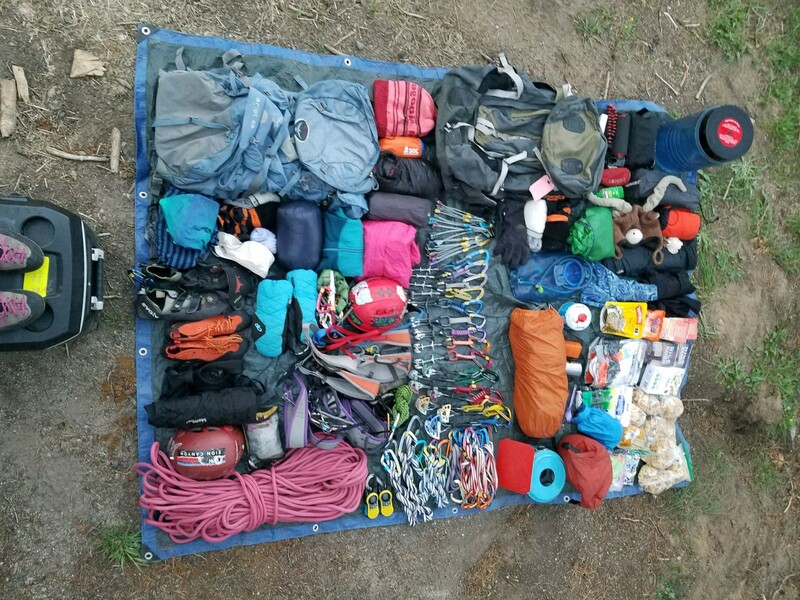 130 lbs of food, camping and climbing gear stuffed into two backpacks. Most of our gear minus sleeping bags, a dozen bars and two dinners. 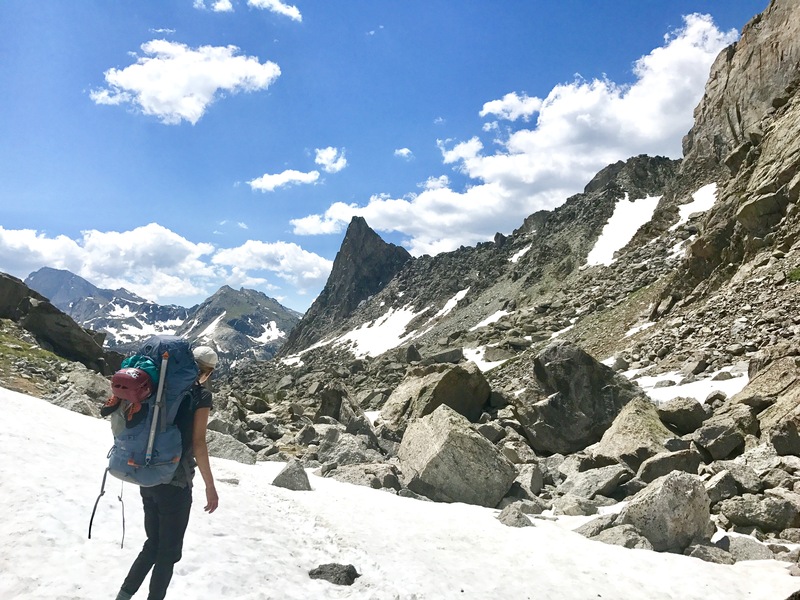 From the trailhead, the path is clear and well worn from many seasons of Cirque pilgrims hauling climbing gear. We were thrilled when the swarms of mosquitos decreased from fifty to a dozen or less despite the constant frequency of lakes and rivers. Our weary legs finally reach Jackass Pass at 10,700 ft after ten miles and 2,500 ft elevation gain under our packs. We are rewarded with a view of massive blocks of granite teeth rising from the gums of white snow. 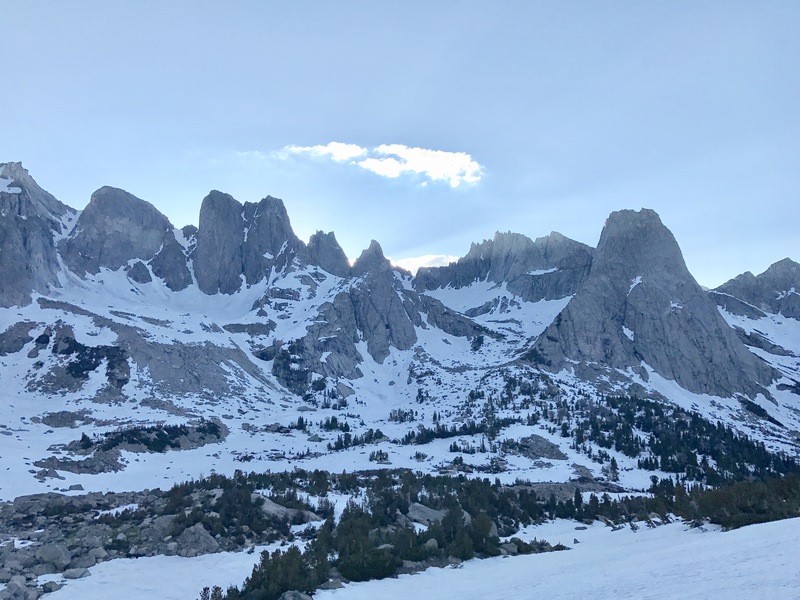 The valley containing the Cirque of the Towers is showing signs of spring melt with pockets of dirt, clumps of trees and boulders just emerging from snowy slumber, but it was definitely still early season. From Jackass Pass onward the beaten trail is hidden under snow that could collapse on any step into a several foot deep void carved out by unseen snowmelt rivers. Our legs begging for relief, as we set up camp for the night next to another group hauling similarly weighted packs for their 14-day backpacking trip. Our second day we woke up without alarm to recover from the hike in and assess the conditions. All routes were dry, however aside from Mitchell Peak and Pingora all other towers required either ascending or descending steep and compact snow. To overcome these hazards we would at minimum have wanted our mountaineering boots and crampons, but we left those in the car to save weight. An additional ice tool or snow protection probably would be the most reasonable for this steep, dense snow. This put most routes in the moderate risk category. Our second challenge for this day was the time. It was already 9am. While the days are long here with first light at 4am and last light around 10pm, the routes are similarly committing. 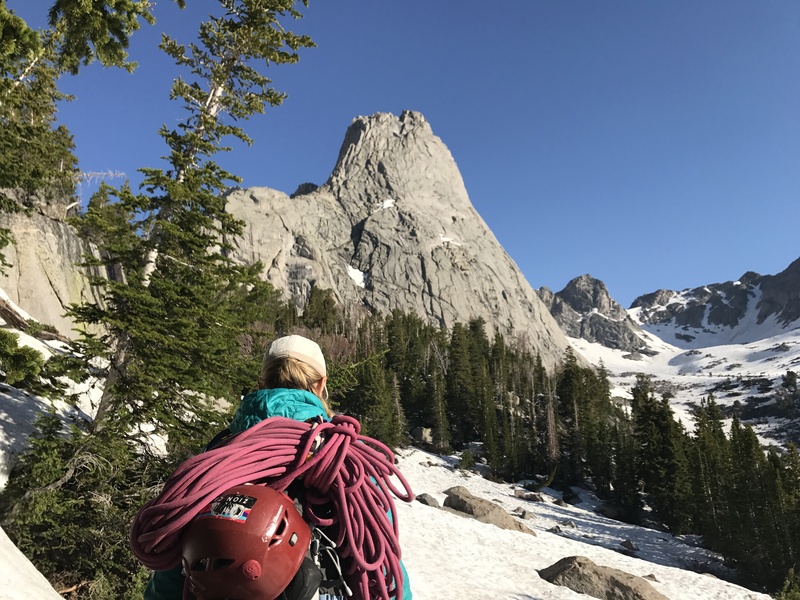 A typical Cirque route requires nine pitches of sustained 5.8 climbing, alpine route finding and a technical descent. View of Warbonnet (center) and ‘the plume’ (lower center). Showing the steep snowy approach on right. All considered, we made the most of our day by moving camp closer to the peak everyone was focusing on: Pingora (11,884 ft). 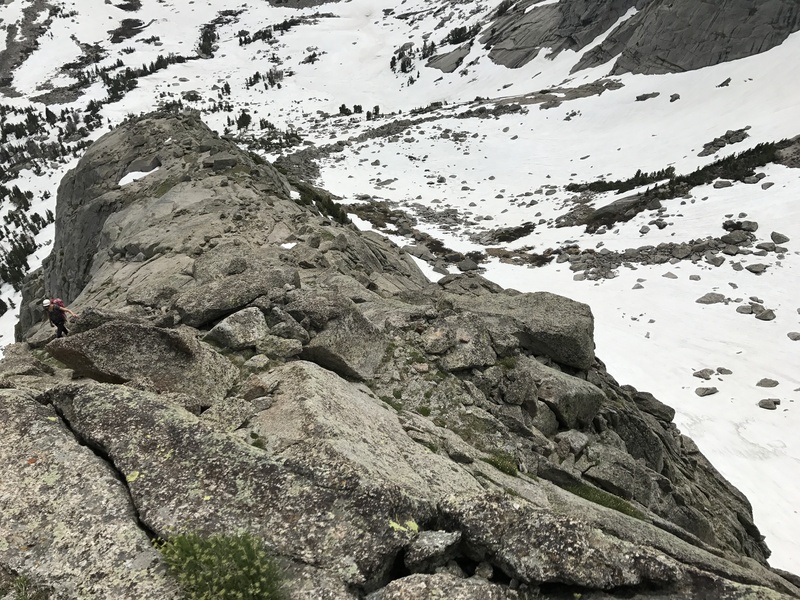 Still quite rambunctious from being in the Cirque and not climbing, I took a few hours to ascend 2000 ft from camp up Mitchell Peak 3rd-4th class route. The East Face is probably only a half hour approach but the next day it took us an hour trek since we started too high. After another half hour wait for a party in front of us (one of only two we would see that day) we started up at 9am. The rock was not Yosemite, smooth granite. It was coarse, with large inch sized crystals that painfully press into your hands as you tightened them into jams. The whole climb consisted of a small set of unrelenting techniques: large fists, awkward hands and liebacking. 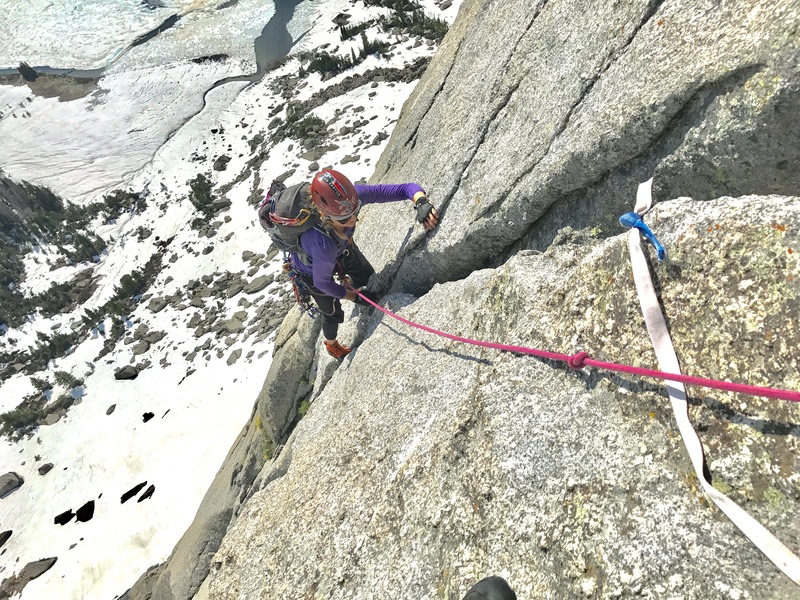 Sadie quickly added this climb to her list of 20 Classic Wildflower Climbs of North America as we passed bouquets of purple, yellow and white. 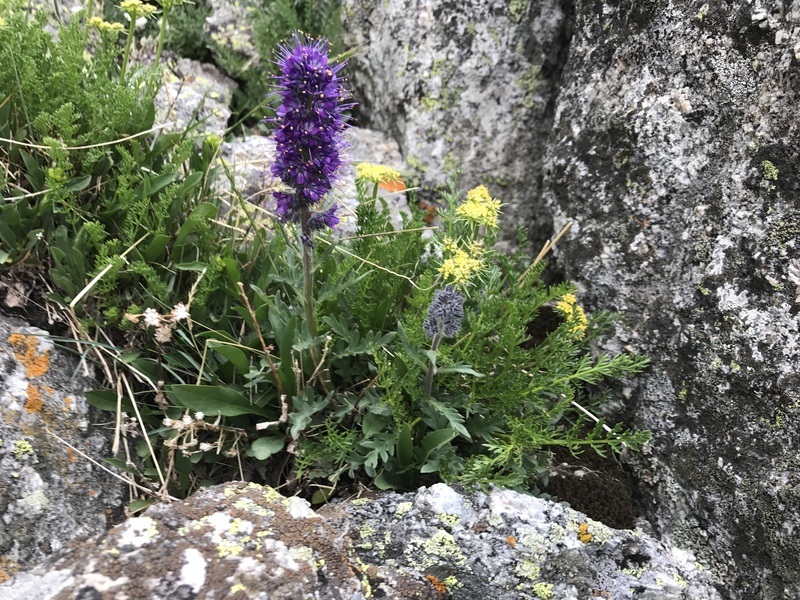 The mosquitos must also like wildflowers because 1200 ft up the rock (at 11,500 ft!) I was still getting bitten by them. The last three pitches were the hardest as the climb became steeper and more like 5.8. Eight full 70m pitches from the bottom we reached the top after eight hours. Clouds had built at 3pm but we never heard thunder so proceeded to optimistically take photos after a scramble to the true summit. 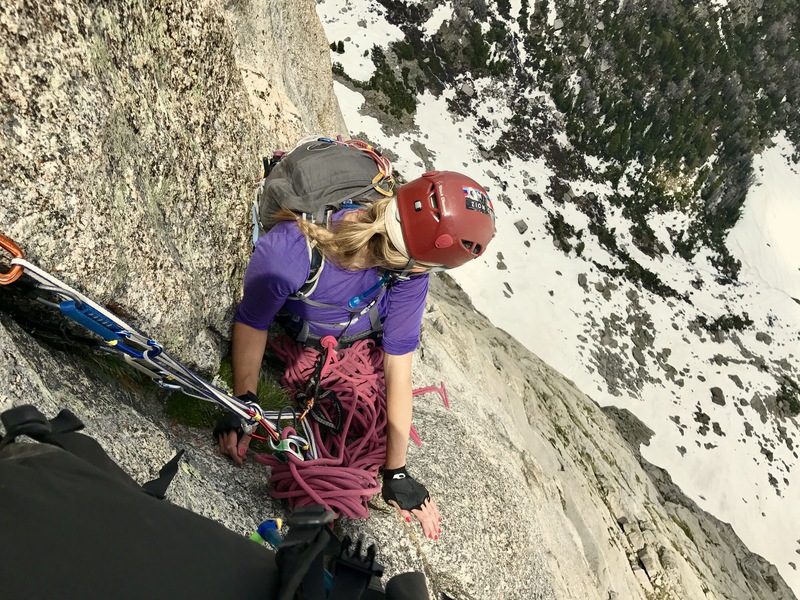 We rapped off some bail gear into a gulley followed by the four real rappels to the South Buttress and a 1000 ft descent to the snow fields below. An hour of post holing and standing glissading brought our dehydrated and hungry selves back to camp for dinner. Searching for the rap stations. The next morning we gave ourselves as much sleep as we wanted after the long day on the East Face. 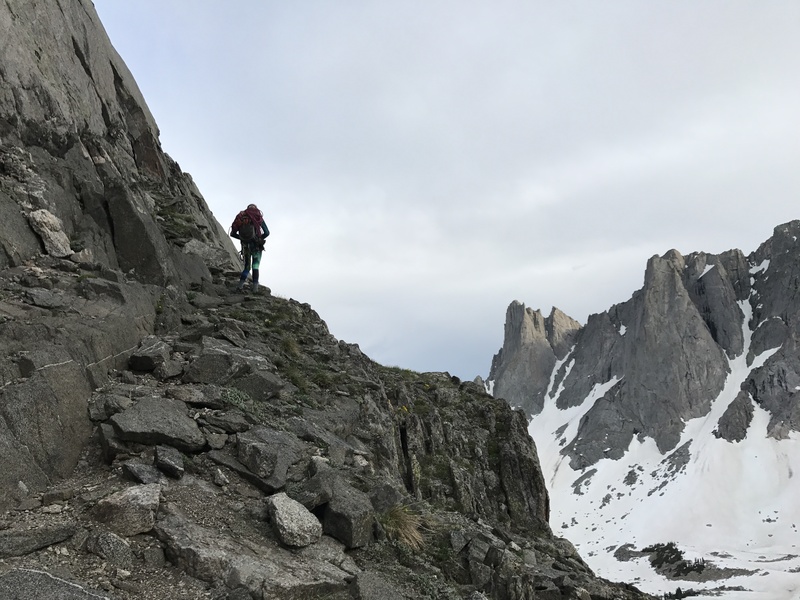 Since the Cirque doesn’t yield itself well for anything shorter than an all day, 1000+ ft climb we targeted one of the shorter 4-pitch routes up Pingora. 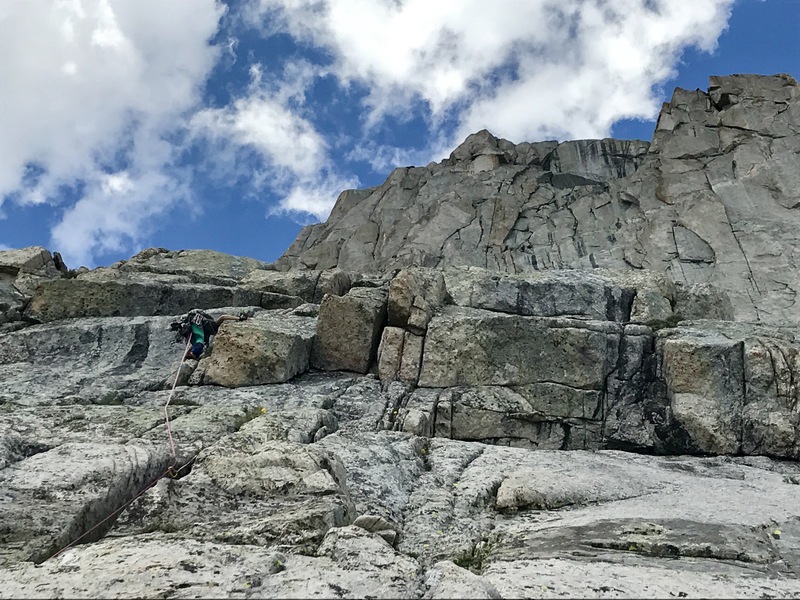 The most popular being the South Buttress route which climbs up through a celebrated feature where several cracks form a K (called K-Cracks). After four days of clear blue skies, we were surprised when the clouds started to consolidate around 3pm into afternoon thunderstorms. We ate a relaxed lunch at the base of the climb to keep an eye on the weather which eventually turned dark and started thundering and light raining around 3:30pm. This was enough for us to retreat, however, this weather evaporated back into blue sky within an hour. This confirmed what our book had said that these afternoon storms were short-lived unless part of a well forcasted 2-3 day front. A good hike and weather beta would be our accomplishments this day as we rested up for another long climb. 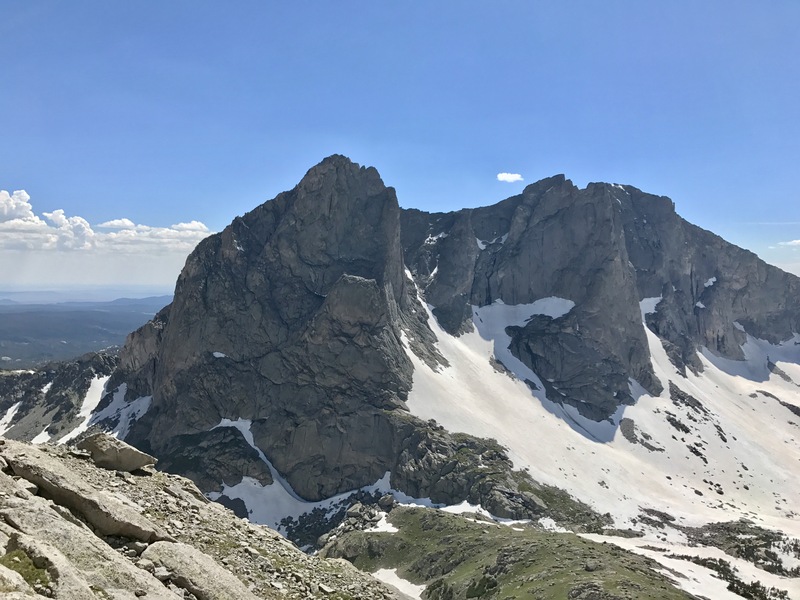 Most people come to the Cirque to climb the Northeast Face of Pingora, listed as one of the 50 Classic Climbs of North America. At 5.8+ this would be the hardest grade IV climb we’ve taken on so we planned to be at the base at 7am for a true alpine start. An hour hike from base camp, the start of the climb was easy to find above a water streaked slab. The early start paid off. The first traversing pitch was already wet and would only get wetter. Overall the climb featured really stellar hand and finger jamming although, in an alpine fashion. Often you have to switch between various crack systems in front of you to link together your moves. The crack is often dirty and cleaned sections dictate hand placements. It is not uncommon for the crack to be shallow and/or flaring but the coarse rock ample supply of features often help with feet or jugs. My partner wasn’t feeling well so we agreed early on that I would lead all the pitches, however, six hours in, at the start of P7, my energy was failing. I started the seventh pitch by almost falling off belay as I got into some off route 5.10- fingers and then continued through the 5.8 off-width crux. The climb was unyielding, the next 500 ft of climbing was steep, continuous, 5.9 crack climbing. I got sloppy and moaned my way through these pitches. It was so unexpectedly hard compared to the 5.8 rating that my partner started aid-following. 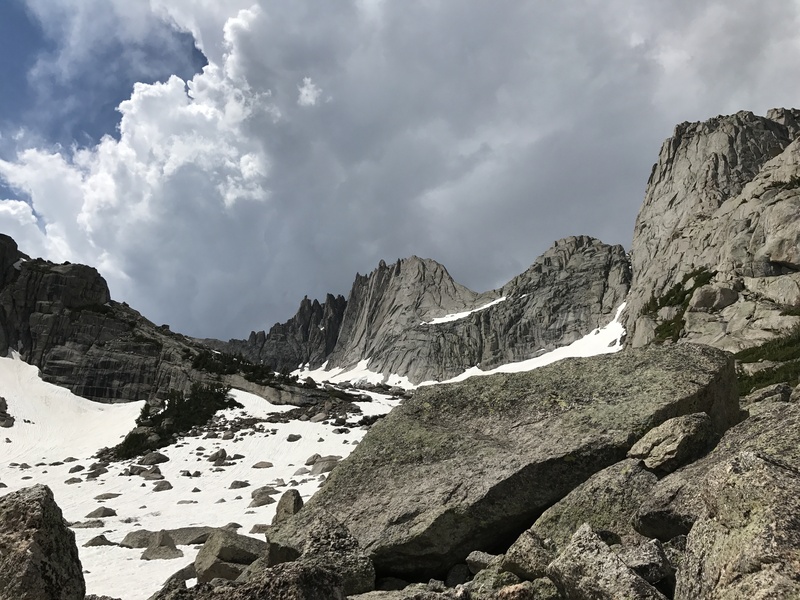 We ignored the afternoon thunderstorms that filled and drentched the Eastern valleys as we slowely strugged to the top at 4pm after 10 hours. I hit a second wind and my mind started working again as we descended the familiar rappels and collapsed back at camp. We completed the climb, but it became type 2-3 fun halfway through. A classic for the grade yes, but much more strenouous than 5.8. We woke up on our sixth day after the struggle on the Northeast Face and decided to pack it out. We were running low on food and energy after two long alpine climbs and a hearty trek in. It was time to return to the front country and change our clothes. We left the Cirque to the three other climbing parties there as we walked out of the valley. Our hike out was in a brilliant green of grass and blankets of spring flowers. 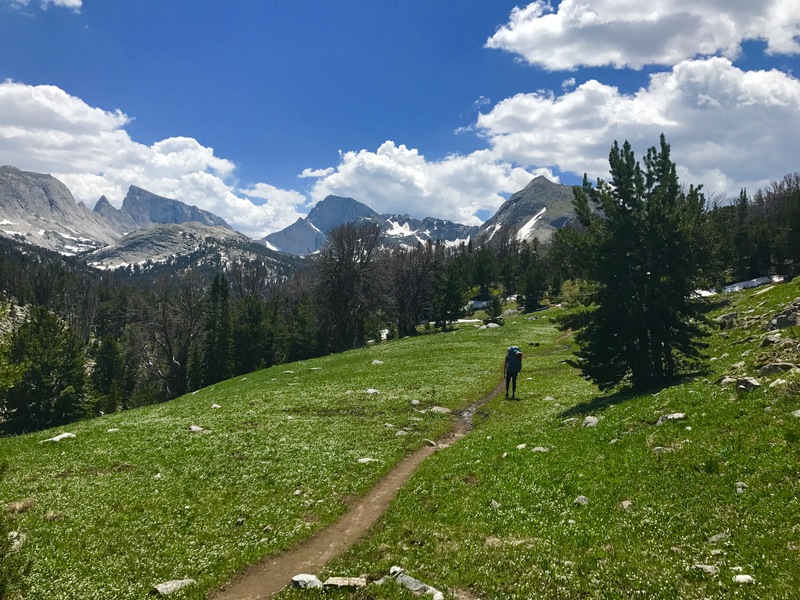 Spring had come to the lower elevations and would soon reach the Cirque. I hope I can return to climb the other classic route here up the Wolf’s Head which is supposed to be similar to Matthes Crest. Hiking out from Jackass Pass. Sundance Pinnacle center. 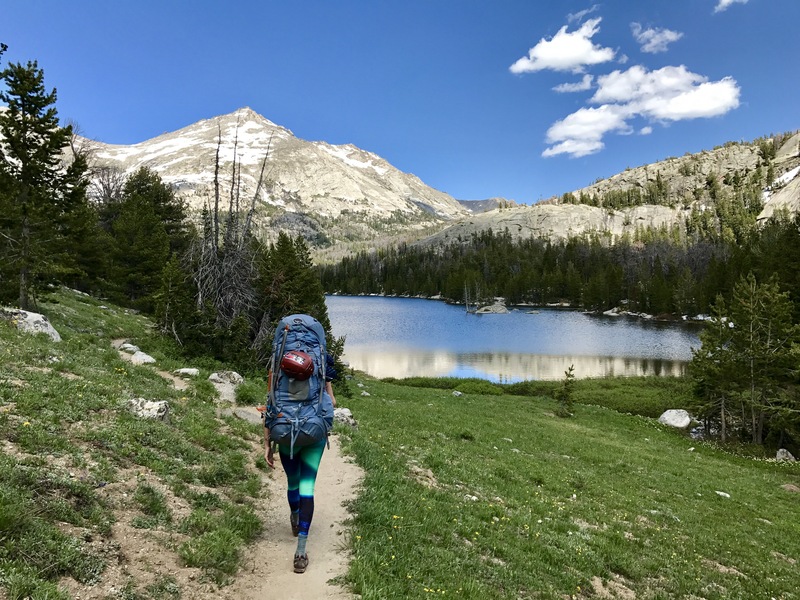 We had consistent blue skies for four days followed by three days of afternoon thunderstorms which rarely affected the Cirque but could look quite fierce and fill up the valleys to the East with only a few sprinkles on Pingora. Not uncommon for it to sprinkle overnight though so keep gear inside. 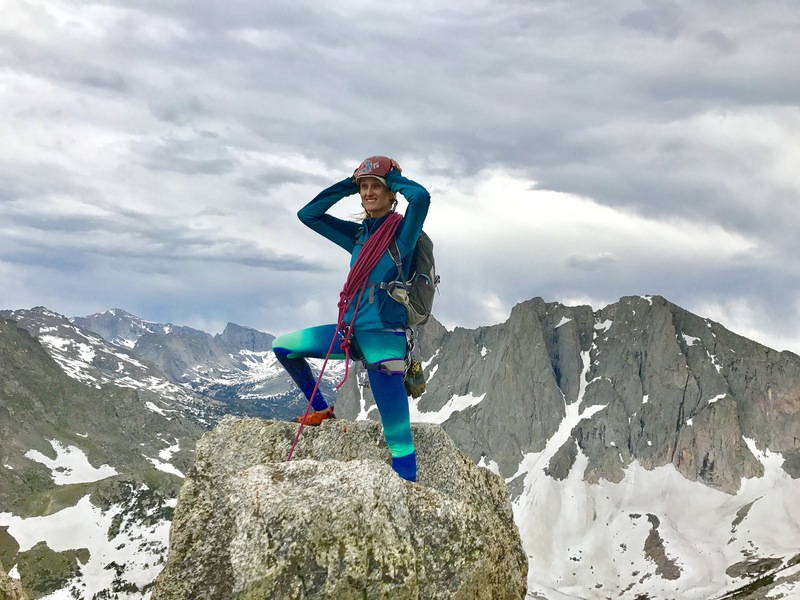 All routes aside from Mitchell and Pingora had steep snowy ascents and descents requiring a minimum of an ice axe, mountaineering boots and crampons if not pickets and a second tool. In two weeks these might be melted out enough for safer non-snow travel. All lakes past Big Sandy were ice covered on July 3 but were beginning to melt out by July 9. 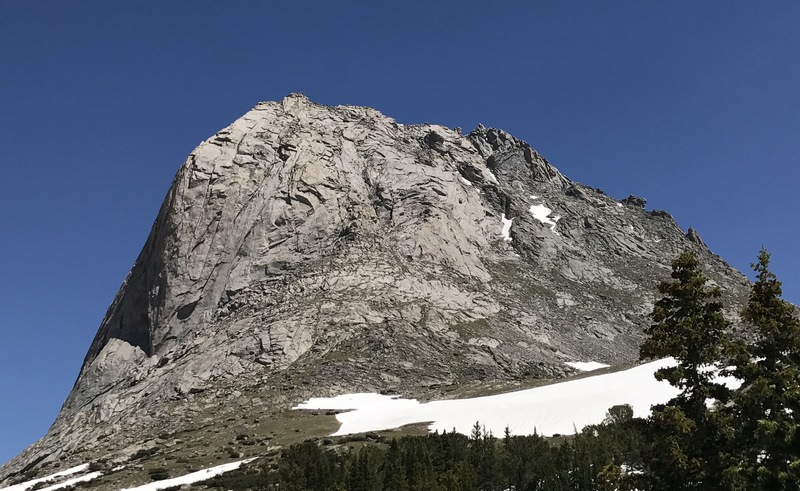 On July 3 there were many small patches of dirt to camp past Jackass pass, but most of the area is snow and the trail is not visible. 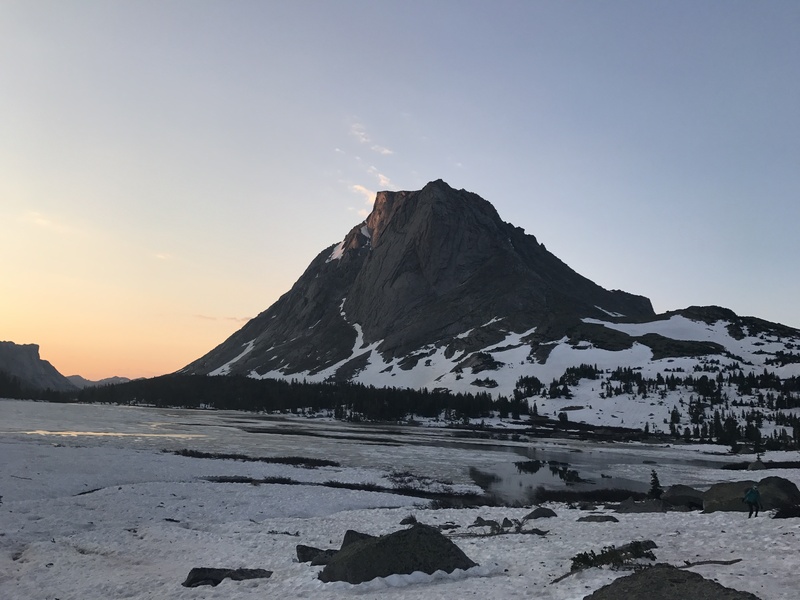 On July 9 it was finally possible to camp on dirt near Cirque Lake in small spots surrounded by snow. Running water is available everywhere as the area melts out. Mosquitos were okay past Jackass past, but I got bitten a dozen times 1000 ft up the wall on Pingora’s East Face. The number of bugs seems to be increasing as snow decreases. There was no sign of bear activity.